Hello Wednesday! 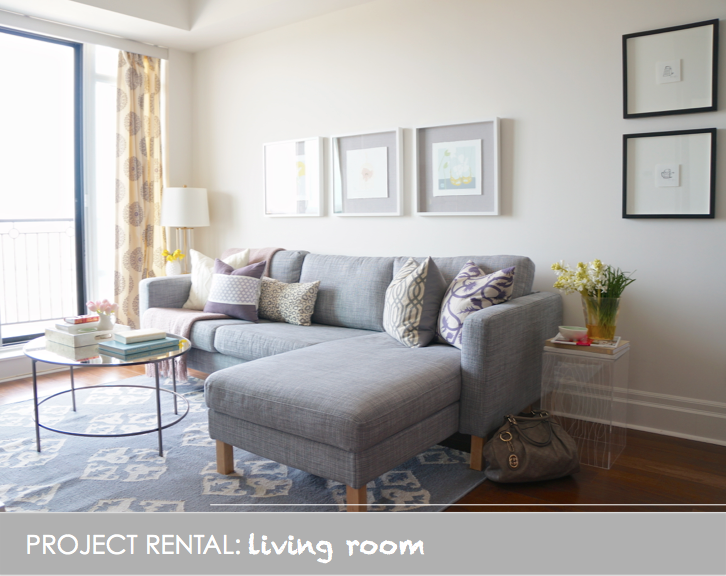 Yours truly just got back in town and despite the extreme cold alert + serious jet lag + battling with a cold + getting ready for an exciting project, I finally have a touch of energy (and time) to share with you the behind-the-scene fun at the making of #ProjectRental: Living Room Edition. 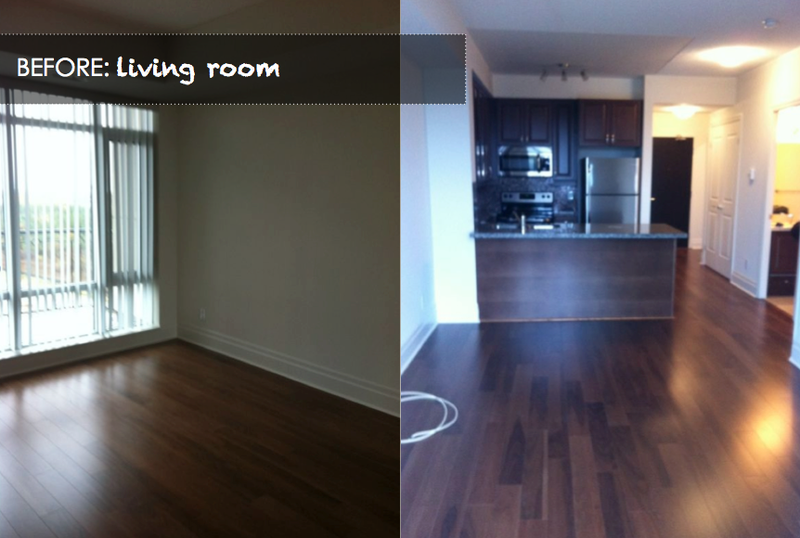 As for the transformation, our goal is to create an elegant yet comfortable, stylish yet livable home. In this open-concept living room + kitchen entertaining zone, I have selected a sectional sofa with a chaise acting as a "peninsula" between the living room and the kitchen to increase sitting capacity when entertaining. 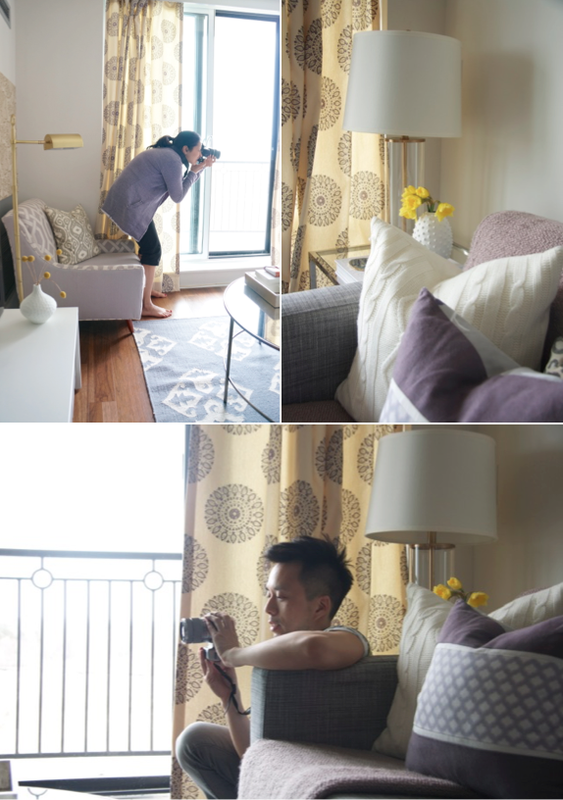 The placement of the sofa against the longest wall in the living room also allows for the best traffic flow and maximum utilization of the space without blocking access to the balcony. The sofa wall is the first spot you see when you walked into the space. So it has to be the feature wall and it better looks good. As for casual meals, the breakfast bar will do the trick. A pair o stools by Sarah Richardson Design (have I mentioned I love her furniture line?) and some beautiful plates & vases from Indigo, fresh blooms, and delicious delights, I am all set for a relaxing afternoon with my favorite magazine! 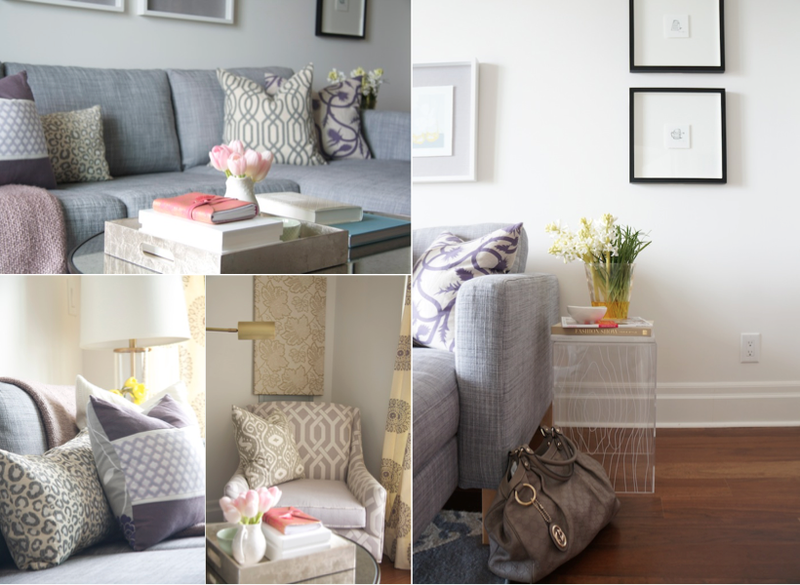 I have known Christine (the client) since Grade 9 and when she asked me to help her with her new place, pale grayish lavender is what came to mind. Lavender could be a tricky color to decorate with, especially when I know Christine wouldn't want a "girly" space. 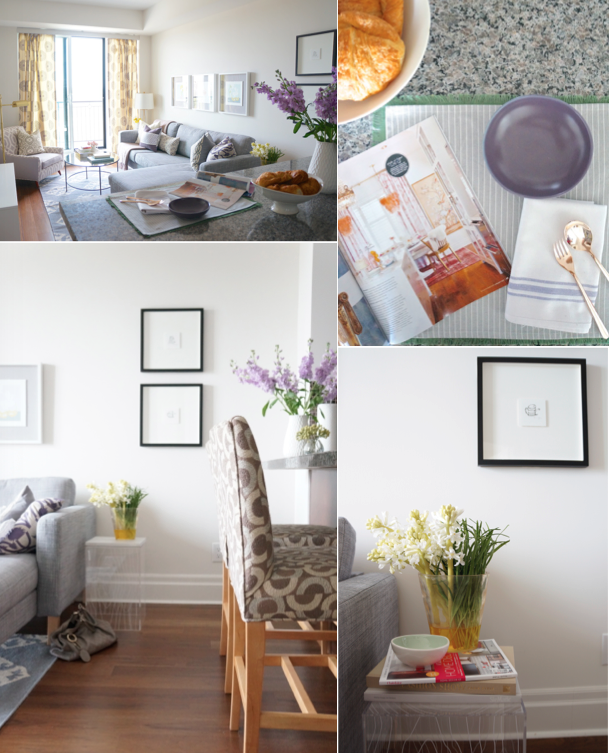 Here is how I used lavender with soft grey and canary yellow to achieve the serene, elegant look. 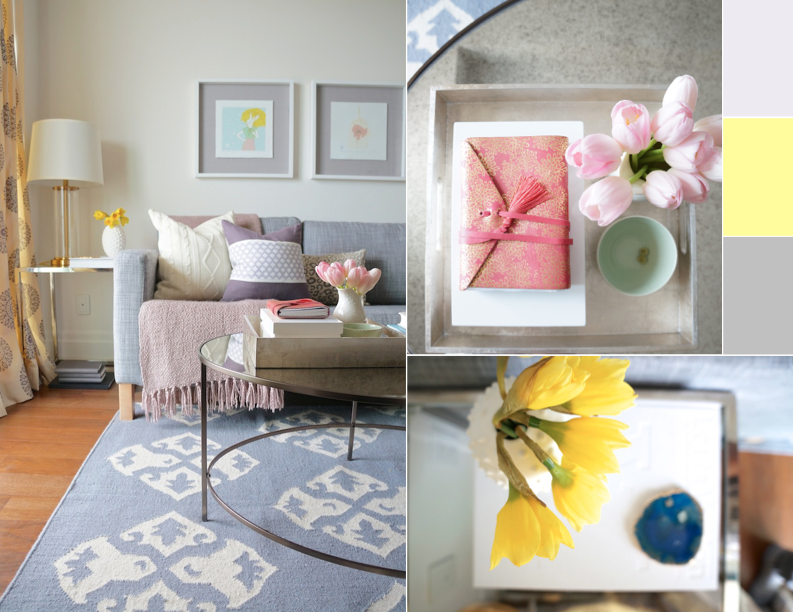 Cheerful yellow and brass accents were injected in the space to add warm to the cool, delicate lavender/grey palette. The custom drapery panels by Tonic Living replaced the harsh vertical blinds for extra softness and patterns, while the large scale medallion on the Andalusia rug from West Elm provides a dynamic backdrop to ground the space. Christine wasn't too keen on having an extra chair in the living room, worrying the space would be too crowded. I convinced her to let me try it and once she lived with the layout for a few days, she was sold! The best part is that this upholstered chair has a classic silhouette and stylish tapered legs and it was free from furniture heaven (a.k.a. garbage area in my condo). 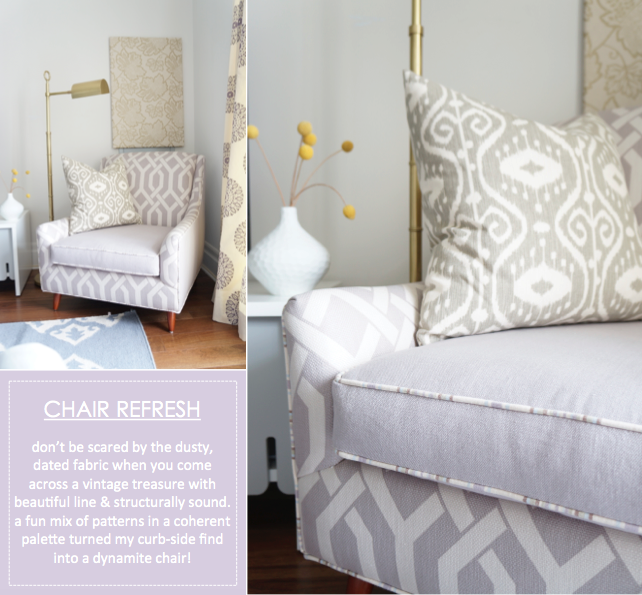 We gave the chair a deep clean + a new dress, it's now a total knockout! The floral panel behind the chair is designed specifically to hind the unsightly air return panel. Not allow to cover it entirely or to hand anything heavy on the walls (since we were not allowed put any nail on the wall), we stretched a piece of remnant wallpaper on a canvas stretcher from local art supply store and voila, super light weight instant art (hung with 3M tapes). 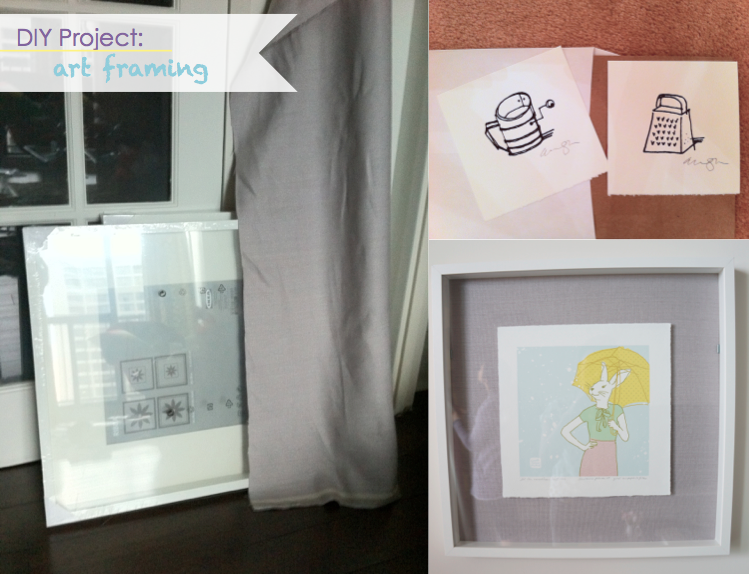 While on the DIY talk, we also did the framing of the artwork in the space ourselves. The trio of pastel colored prints are from Carococo and the black & white screen prints are of course from my favourite Alanna Cavanagh. Thanks M for all the fun at the shoot and of course Christine for taking a leap of faith so I could do whatever I want with her new home. Come back next week to check out the bedroom! Looks great! I am in love with that chair, I wish my garbage room produced such finds. It was a lot of fun and the place looked amazing. Loved seeing it in Style At Home shot by a professional! Let's get together for some Ramen soon. Hope you are well. As always, I love what you've done Tim. Great living room - stylish & comfy!! One question: No TV? I just found this blog and love this couch! I am looking for a gray couch, where did you find it? Where did you get the couch?